Enjoy Romania’s wonderful flying places! Paramania’s tours are the little escapes in one not very popular, but very charming country, where legends with Dracula mingle with true stories about welcoming and warm people and where Transylvania is not just a place to visit, but for some it even means “home”. Even if you are licensed or not, we prepared a type of tour for every enthusiastic paraglider who would like to fly in Romania! 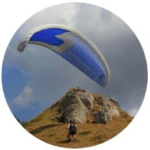 For all the licensed paragliders who are experienced in thermic and XC flying. For the non-licensed paragliders who want to learn how to fly in the heights of the sky. We are an experienced team of paragliding pilots that have tried all the best flying sites in Romania. Our passion for flying began many years ago and now we want to share the things we have learned and the beautiful places with all the enthusiastic paragliding pilots around the world. Are you one of them? The starting point for our trips will be Brasov, the Transylvanian old city. Based on the information you provide us about your experience and depending on the period of time when the tours take place, we will be able to recommend the right flying spots or XC tracks to get the best out of this trip. Postavaru – Poiana Brasov, Bunloc – Brasov, Miercurea Ciuc or Priseaca are just a few of our favorite places for flying. All of them are reachable by car or cable car. *flight instructors who come with students will receive a discount. (for more details, please contact us). Our beginner courses are meant to help you experiment the great feeling of becoming an independent paragliding pilot by gaining more experience while travelling. The courses and trainings will take place around the cities Brasov and Miercurea Ciuc, which have perfect take-off places for initiation in this amazing sport. 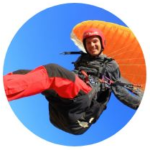 We will begin our courses with information about your flight equipment, procedures, notions about paragliding, meteorology, aerodynamics, and much more. After you acknowledged all that, you will be prepared for starting the ground training, take-offs and landings and low altitude flights (10 – 150 meters high). For this stage to take place we need minimum 4 participants to sign up, so take your friends and start having fun together. You will not only participate in training, we will also take care to provide all the information you need to explore and enjoy Romania and Brasov.